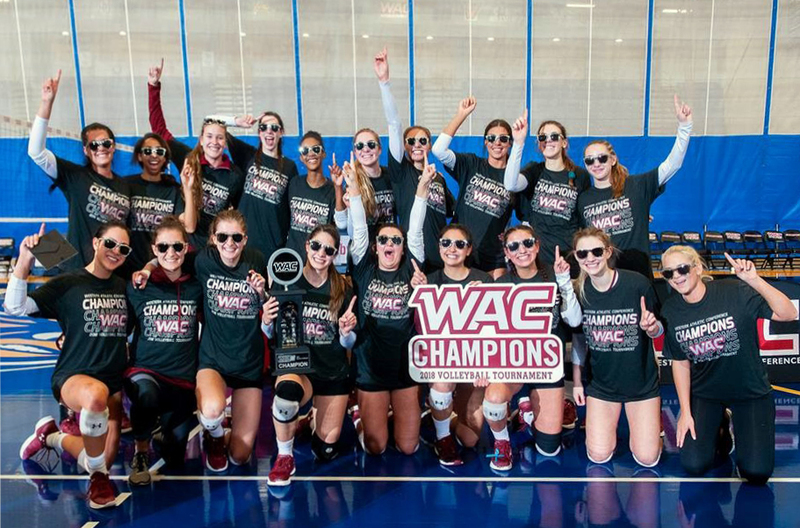 The New Mexico State Aggies volleyball team was crowned WAC tournament champion on Saturday, Nov. 24, at the Icardo Center in Bakersfield, California. The Aggies defeated Utah Valley in the championship match by a score of 3-1. The Aggies finished second in the WAC regular season and earned a first-round bye in the WAC tournament. In the semi-final match, the Aggies defeated the University of Missouri-Kansas City 3-1. In the championship match, the Aggies came out of the gates slowly as they dropped the first set 25-19. Early in the second set, the Aggies still couldn’t find the rhythm they needed to push past the Wolverines from Utah Valley. The Aggies found themselves in a hole down 15-10 midway through the set. NMSU then came together and rallied for three straight points, which gave the team some much needed momentum. The Aggies were able to tie the set at 20 before losing their lead 22-21, which led to an NMSU timeout. The Aggies kept fighting and were able to tie the set again at 24. After trading a couple points with one another, the set was tied at 26. NMSU freshman Savannah Davison made a statement as she got two kills in succession to give the Aggies the win 28-26. With the match now tied at one apiece, it turned into a best-of-three series for the WAC tournament crown. The third set was an intense back-and-forth affair with no team really gaining an edge. Senior Briana Ainsworth got a service ace midway through the set to give the Aggies the advantage 16-13. The Wolverines followed that with a couple of attack errors and were forced to call a timeout. After the break, the Aggies kept up their offensive pressure and came away with the victory 25-20. In the fourth set, New Mexico State was able to jump out to an early three-point lead. NMSU kept its momentum and built a 15-11 lead heading into the media timeout. Following the break, the Aggies rallied for three straight points to push their lead to seven. The Aggies seemed to sense the title was in their grasp and made sure not to let it slip. Senior Tatyana Battle got a kill to send the game to match point and junior Brigette Lowe finished off the match with a kill of her own. The Aggies won the fourth and final set by a score of 25-17 to claim their fourth WAC tournament title in the last seven years. Following the match, it was announced that three NMSU players earned all-tournament honors. The three players were Battle, Davison and junior Megan Hart. Hart also earned the prestigious Most Valuable Player award for the tournament. With the tournament win, the Aggies earned an automatic bid to the NCAA tournament. NMSU will head to Eugene, Oregon, to face No. 15 University of Oregon in the first round on Thursday, Nov. 29, with the first serve set for 8 p.m.